The green tree frog is known for its vibrant green body offset by its white belly. Though they are small and delicate, they are a good choice for beginning reptile owners because they are easy to care for. Providing a proper habitat for your green tree frog is important for his health and happiness. The frogs can naturally be found in the southeastern area of the United States. As a result, they prefer warmer, humid temperatures. They also tend to live near wet areas like wetlands, swamps, ponds, lakes, creeks and streams. There are several factors to take into consideration when setting up their home to mimic their natural habitat. A glass aquarium no smaller than 10 gallons is suitable for a green tree from. Look for a tank that taller than wider since the frogs enjoy climbing. An ideal size is 18" wide by 18" deep by 24" high although if you have more than one in your tank a better size is 24" wide by 18" deep by 36" high. Make sure your tank has a locking lid to keep your frogs from escaping and exploring your house. The ambient temperature in their tank should be around 70 to 82 degrees Fahrenheit with a range of temperatures in the tank and at least 50% humidity. They will also need an area to bask with a heat lamp or a heater that goes under the tank. The heater should be position at either end of the tank but not in the middle. In addition to a bowl of water to keep the tank humid, you should provide mist every day with a spray bottle or an installed mister. Since the exact temperature and humidity percentage is important to monitor, be sure to purchase a dual thermometer and humidity gauge for your tank and check it daily. Unlike some reptiles, they do not need UVB lighting although you may want a UVB light if you have real plants. Since the frogs are nocturnal, the lamp should be turned off to give them at least 12 hours of dark per day although they can have up to 14 hours of light during the summer. You can also use a night-specific bulb and switch it on in the evening and use a fluorescent bulb during the day. Avoid using any type of substrate that is small such as pebbles because the frogs can easily swallow them which can ultimately be fatal. Green tree frogs will need items in the tank that simulate their wild environment. Typical items used in aquariums are driftwood, cork bark, and branches. These are best purchased from a pet store as wood picked up from outside is not safe for your frog. If you still want to use natural wood from the outdoors, you can treat them with a water and bleach solution to clear them of parasites and harmful bacteria. You should soak at least overnight or longer and then rinse off before putting in the tank. In order to keep the tank humid and provide them with an area to frolic in, a shallow bowl of clean water should be available. Make sure the water is shallow because they can choke if it's too deep. Depending on the size you can even put in a rock or branch for them to move onto once they are done bathing. 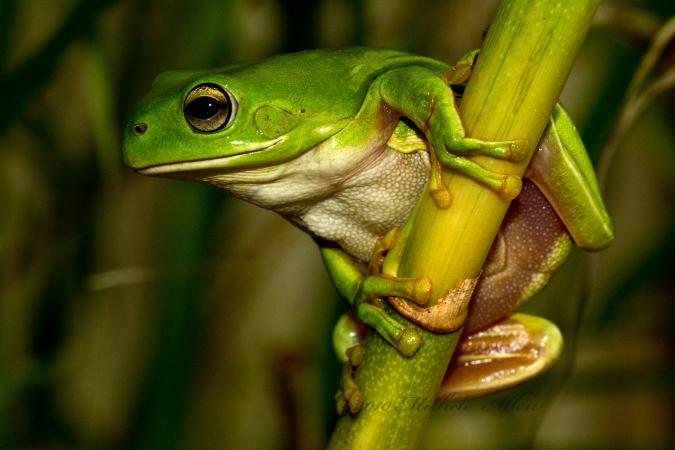 Can Green Tree Frogs Live With Other Species? While you can have more than one green tree frog in your tank if it is large enough, do not put any other species of frog in their tank. They can be competitive with other species over food and other frog species can make them stressed. Some species are also toxic to each other even if they are not to humans. Do Green Tree Frogs Make Good Pets? While green tree frogs are not a pet that you will be handling all the time, they do make a lovely addition to your home with their striking colors and their leafy aquariums. They don't require frequent tank cleanings due to minimal feces and only eat a few days per week. They make excellent pets for the first time reptile enthusiast.